Close to Ephesus, is the small town of Selçuk (pronounced Selchuk in Turkish). 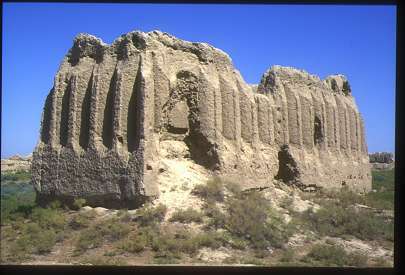 The place draws fewer visitors than its more well known neighbour, though it has its attractions. 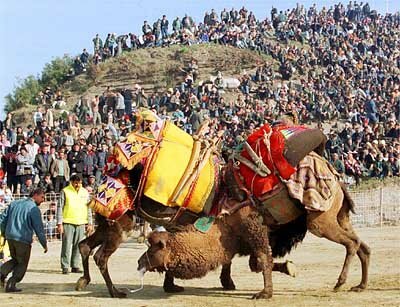 One of these is the camel wrestling festival every winter, an event that largely goes unnoticed by tourists, most probably because it takes place in winter when few are prepared to move from cold Northern Europe to a place that can be just as cold, Anatolia. Winter is the mating season for camels, and so would coincide with their desire to fight off males looking for mates. It is also the time when the growing season is halted by snows, and so nomads forced down to lower pastures would provide or look for some form of sport and entertainment, camel wrestling provided both, as well as being a way to earn money. Owning a winning camel in nomadic and village life is a way of gaining a certain notoriety; men defer to winning owners, children admire such men, and women vie for their attention, it is said. The camels are given names like Thunderbolt and Destiny, though I didn’t hear them for the roar of the huge crowd on the cold winter’s day when I went along, diverted by chance from my visit to Ephesus; the bus I was traveling on broke down in Selçuk, and I alighted in the middle of the parade through the middle of the town. Of course, any large gathering of men in Turkey is an excuse to eat and drink and be convivial; the parade of camels in Selçuk is no exception. Men from all over the region, and sometimes further afield, descend upon the town to change this sporting event into a festival. The event is essentially a rural one, relatively unsophisticated, traditional, lively and runs counter to more modern forms of entertainment. There are rules, apparently, though I was at a loss to discern any. If one camel declines to fight, its challenger is automatically declared the winner. If they both stand and fight, however, the winner is the animal that stays on its feet. 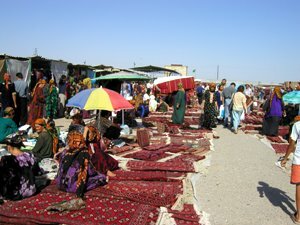 Prizes take the form of carpets given to winning owners, and although these are machine made, and inexpensive, they are still awarded and prized and signify that the contest has been fought and won. As one man said, “This isn’t about money, it’s about continuing something that was handed down to us by our grandfathers and their grandfathers. In the evening, the camels are herded onto trucks or into pens for the night, and the revelry continues. Men play traditional musical instruments, drink Turkish raki neat, in large amounts, and accompanied by white feta cheese and lumps of ‘karpuz’ – water melon. I stayed in a local ‘pansiyon’, woke with a hangover, ate a hearty breakfast of boiled eggs, olives, bread and tea, and later returned to the city of Izmir, to the noise and the rush of modern life, thankful to the camels and their owners for providing an entertaining diversion from my normal routines. Being east of the Caspian Sea, bordering Uzbekistan to the east and Iran to the south, it certainly did feel ‘out of the way’. When Alexander the Great reached the southern shores of the Caspian, he imagined he had reached the point where the Mediterranean Sea comes back upon itself – basically, he hadn’t a clue where he was. Crossing the Oxus, now the Amuderya River, longest in Central Asia, and watering the last lingering drops of the Aral Sea, must have been similarly bewildering for him, geographically speaking. So it was for us, suddenly confronted with this Nile-like waterway near the town of Charjeow on the Uzbek border. Whilst traveling east from the capital to the town of Merv, now Mary, rhyming with ‘Harry’, not ‘hairy’, on to the border town, I think I saw its name spelled about ten different ways – a transliteration from Cyrillic Russian. 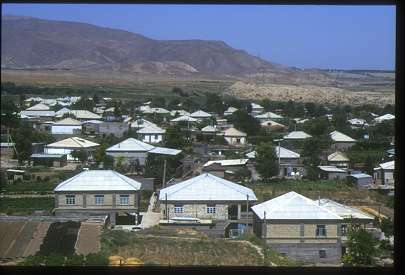 Ashgabat, the capital was destroyed more or less completely by an earthquake in 1948. Little is left from before that time, and one of the flats we inhabited in the district of Jubilany, wouldn’t have looked out of place in the middle of former tenements in Scotland’s biggest city, Glasgow. Later, we moved nearer to the centre of the city, only a walk away from the Turkmen Turkish International University, where I taught English to Turks, Uzbeks, Tartars, Russians, and of course, students from Turkmenistan. All spoke Russian outside the home, their own particular brand of Turkic inside, and English in my classrooms. Flats in town had very low ceilings, built that way to save building materials, it was said, and on the expressed orders of Secretary Kruschev, no less, in the days before the swift decline of the Soviet Union. 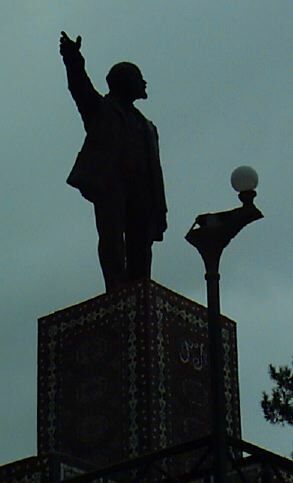 Everywhere in that city, one can see evidence of two regimes: the former Soviet one, and the newer, independent Turkmen regime under the auspices of Tuirkmenbashi, President Nyazov, whose statue and likeness in paint can be seen everywhere, on every street corner and in every square of the city. On Saturdays, when I had the day off to roam around looking for tea, flour, or sugar, I invariably wended my way to a little park quite close to the offices that employed my wife. This particular one had only one special feature – a very special one – a statue of the former leader and ideologue, Lenin. Typically, this statue had the great man holding forth to a crowd of workers by the Nevsky in St. Petersburg, soon to be known as Leningrad, and now renamed back to its former sobriquet. Looking up at him, in full flight, denouncing the ills of the day and pointing skyward, it is easy to imagine the power of this man’s rhetoric, urging revolution to the hungry masses of the then Tsarist Russia. Those days are long gone. These days, there is talk of the vast reservoirs of natural gas and oil below the plains that were once below the waves of the larger Caspian Sea, for this largest of Earth’s inland seas was, and surely still is, subject to tectonic upheaval, changing in shape and covering a much vaster expanse of what is now desert and salt flat. 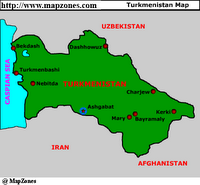 In the capital too, more is made of Turkmen poet, Matymguly, than Lenin, Stalin or Kruschev. 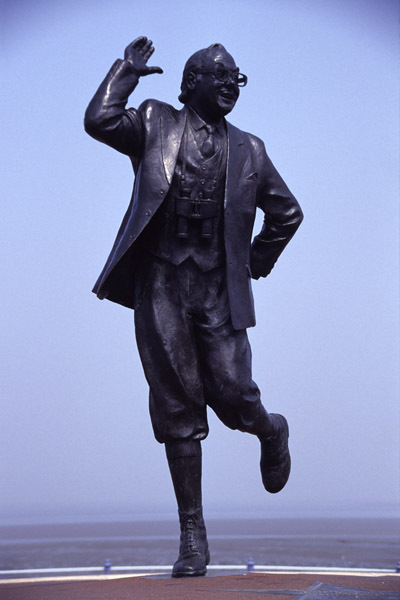 The poet’s statue sits impassively in the middle of a street bearing his name, his words appear on posters and are read on state owned television, and his name was regularly brought to my attention, particularly when I was holding forth on Wordsworth or Milton in my lessons. The people, young and old, have a pride in their country, in their leaps and bounds into the 20th and now the 21st centuries, and in the train of events that made it all possible. 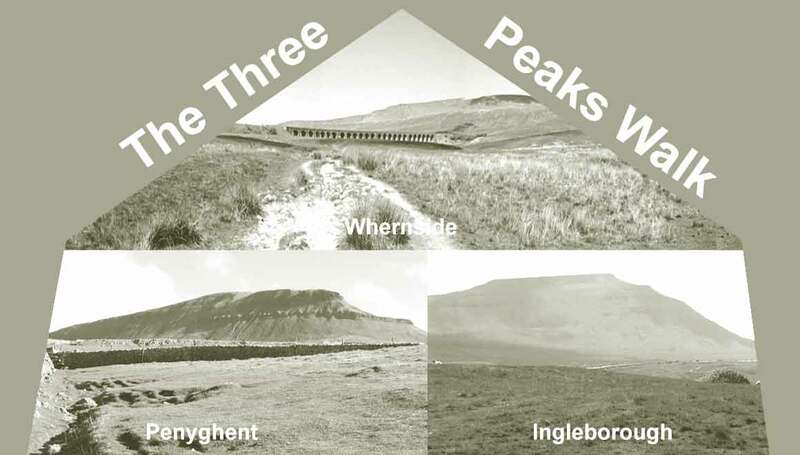 Essential qualities needed to complete the Three Peaks of Pen-y-ghent, Ingleborough and Whernside are strength and fitness, stamina and a determination to succeed. These are admirable qualities in any undertaking, but for this walk they are vital. The walk covers 22 miles or so, and it has to be done in under 8 hours. Don’t quote me here, I might be a bit out. At any rate, that is how I remember it. 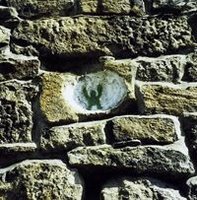 I was a member of a team of lads from Bewerley Park Outward Bound Centre, near Pateley Bridge in the valley of Nidderdale, which is in the Yorkshire Dales National Park. We had more or less come to the end of a 5-week course there, so we were all fit, and we were all 16 years of age. The masters from Bewerley Park accompanied us, as they did on many of the route march type exercises we had to do while we were there. This walk was special. We were picked out from the classes of boys. Some boys were bigger than me, some a bit smaller, but we were all fit; and we needed to be. Taking us to the start of the walk at Horton in Ribblesdale in the Park Land Rover was the first trial some had to overcome; a few were sick to their stomach as we flew up and down the glacial moraines left by the glaciers that gouged out these valleys. As we leapt out, some were still a little white around the gills, as they say, but they soon recovered, as I remember, and we set off for the first of the three peaks. 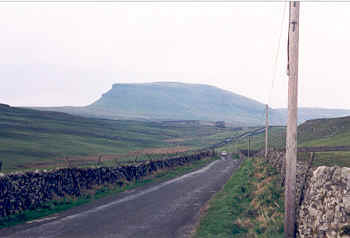 This was the Welsh sounding Pen-y-ghent, several miles up the green roads that lead out of the village of Horton. 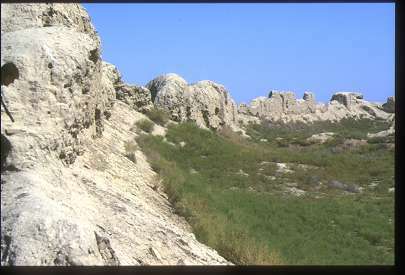 The way climbs gradually until it reaches the foot of the hill. 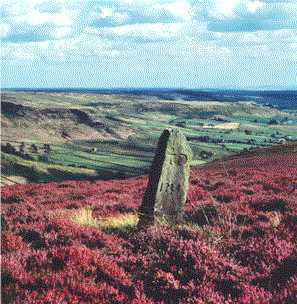 From this point, it is more of a scramble than a ramble; against the clock, it was a sharp uphill dash to the trig point on the windswept top. From here, we could clearly see the rest of our path, and the other two peaks. I think the leaders allowed us to eat an orange here, and we relished the tangy juice and the soft pulp that stuck on our teeth, the taste of oranges staying with us as we descended to Hull Pot on to the foot of Whernside, our next peak. Whernside is higher than its namesake, Greater Whernside, though perhaps not as vast in area as the hill we were about to climb. Running and walking, running and walking, like we used to do whenever we were late for school, running a lamp post, walking one and so on, we became almost giddy and laughed as our legs carried us down, down to the valley bottom. It is well that we found something to cheer us, for the climb up to the final face of Whernside was a weary one; it just seemed to go on and on, never steepening or changing underfoot until the hill suddenly reared up in front of us. “Rest, lads,” said one of our leaders, a Mr. Lawson, and we threw off our packs and lolled as boys do when teacher goes off duty for a second. Back on our feet, we all felt the tiredness of the walk now. That rest had relaxed our taut calf muscles and exertion hurt. The stamina I mentioned earlier has to kick in here; the rest is just hard work, but we reached the long ridge-like summit of Whernside in cloud, unable to see into Dentdale hiding behind the back of the beached whale that is Whernside. At this point, Mr. Lawson told us to eat our dates; a block of squashed dates that I gladly pulled apart and ate too quickly. 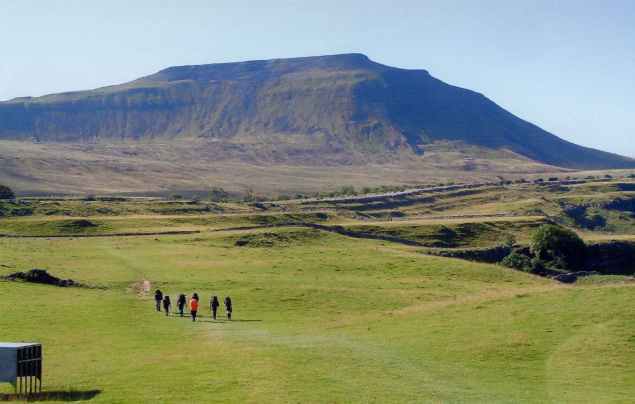 Before the valley bottom, heading for the final peak of Ingleborough, I had stomach pains so hard that they felled me and I had to stop and drink water, much to the disgust of a few of the lads that belonged to other house teams at Bewerley. That few minutes cost us dear and we almost had to run up Ingleborough and down the other side to the start at Horton. We made it in time, but it was close. The journey back in the Land Rover was a quiet one; we were all dead tired, some were still fomenting their ire, I closed my eyes and shut them out, and we arrived back at the Park gates as dinner was being dished out to the boys and girls sitting at long tables. My place was there, between Stephen Howis and a lad from Huddersfield, whose name escapes me now. They weren’t really interested in what I had been doing all day, so I ate my dinner in silence. 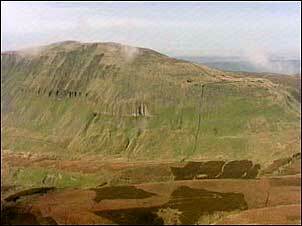 Still, I had done the Three Peaks Walk, I had, and I glowed inside from the exertion and from the achievement. Standing in the Royal Mile, waiting to be let into the Esplanade for the evening's performance of the Military Tattoo, my wife pointed to a coach load of soldiers, and said, "Turks!" The men looking out at the crowd did indeed look Turkish; they had big moustaches and dark eyes, they looked like every other man I had ever met in Turkey. 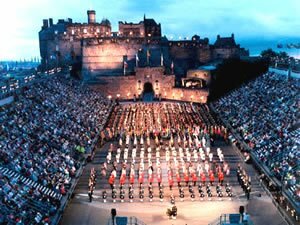 We continued to wait, and we just made it to our seats before the marching and the mass bands of pipers and drummers began the spectacle that is the Edinburgh Military Tattoo. The Tattoo never fails to totally take you in, and if you have any sense of British history, it brings a tear to your eye. It brought several to mine thoughout the magnificent evening. My grandfathers had both fought in France in what they called, 'the first lot'. They served in the Black Watch and the York and Lancaster Regiment. My father and my uncles had all served during the 2nd World War, my father serving in the Royal Navy, my Uncle Evans in the RAF Regiment, and my Uncle Randall in the Tank Corps, with Uncle Walter conscripted into the Fleet Air Arm in the years after the war. 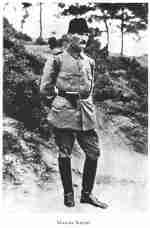 My father in law, Erdogan Ener, my wife's father, had served in the Turkish Army in Northern Cyprus and elsewhere. Our families both have a good pedigree where fighting for one's country is concerned. The night's entertainment proved to be one of the most enjoyable experiences of its kind, as it is for everybody who sees it. The highlight, for both of us though, was the appearance of the Mehter Band from Turkey. 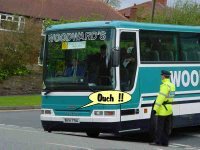 Nazan had been right; the men on the coach had been Turks after all. The band played their own instruments, which, being very different from the other instruments played that night, made a very different and distinctive sound. That sound brought a lump to my throat and tears to my eyes. 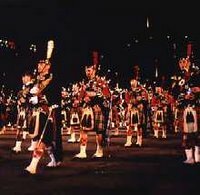 We had both travelled from Adana in southern Turkey, via Manchester to the Scottish capital, had bought tickets for the Tattoo without knowing that the Mehter Band was the guest band. It was a most pleasant surprise for both of us and one we will remember for a long, long time. The programme notes below helped us fill in the gaps. It was a splendid night; it always is. Quick March: "Within a Mile o' Edinburgh Toon"
"See the Conquering Hero Comes"
Men from the 2nd Bn Scots Guards"British Grenadiers"
"It's a long way to Tipperary"
A Land-Rover race with a difference. Green Grow the Rushes Oh! 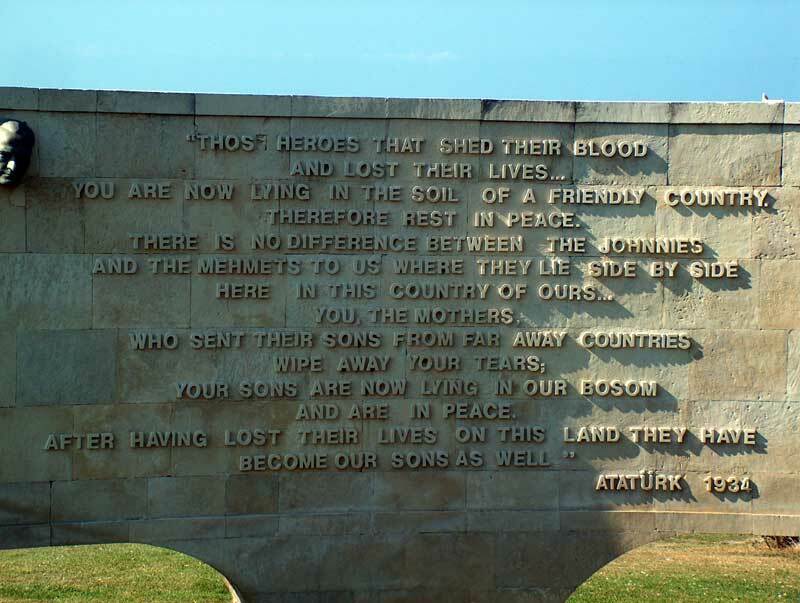 These are the words that are written on this stone tablet commemorating the fallen of both sides at Gallipoli. here in this country of ours. They have become our sons as well. 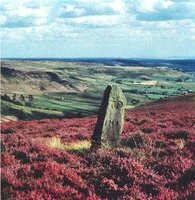 The Lyke Wake Walk starts in Osmotherley on the Western edge of the North York Moors, and ends at Ravenscar on Yorkshire' North Sea coast. 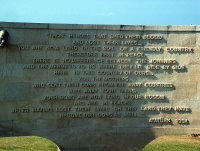 It is 40 miles from beginning to end, and it has to be done in within 24 hours, and between north and south 'goal posts'. Me and Tim Shaw missed the northernmost limit with about 10 minutes to go on our first attempt. Actually, we ended up sitting on a bench in front of the Flask Inn taking off our boots, and enjoying a pint as the seconds clicked down to zero. 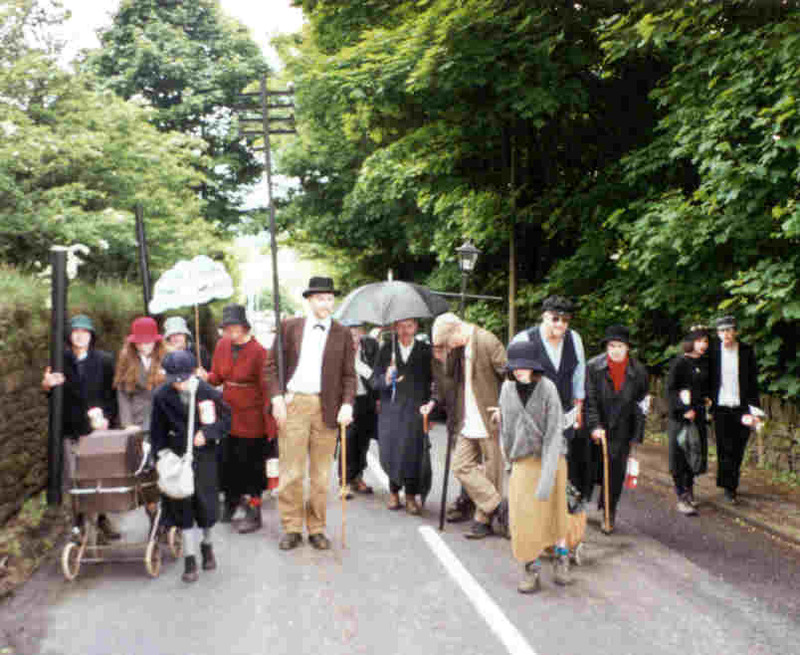 We completed the walk the year after, in some style, and with a few hours to go. Someone who had completed the walk wrote a take-off of Lewis Carrol's Jabberwocky to commemorate their footsore excursion. One or two lines stand out - something about 'the frowsy knee' and on to 'shunning the frumjous unexploded shell' - that's all I can recall, though the rhythm of Carrol's poem was used, and still reminds me of that walk. they will still be there intact awaiting the unwary. 40 miles is a long way. 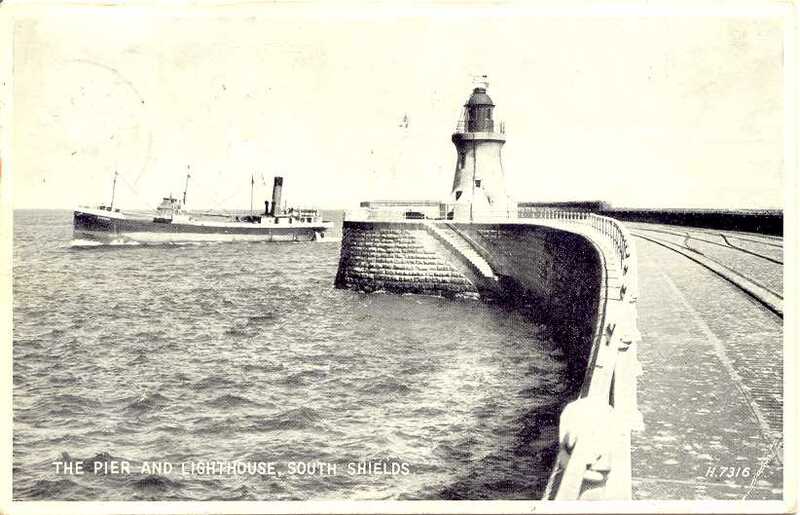 South Shields and North Shields lie either side of the Tyne before it opens at Tynemouth and the North Sea. Today, the two small towns are linked by a ferry that runs regularly across this once busiest of England's northern rivers. 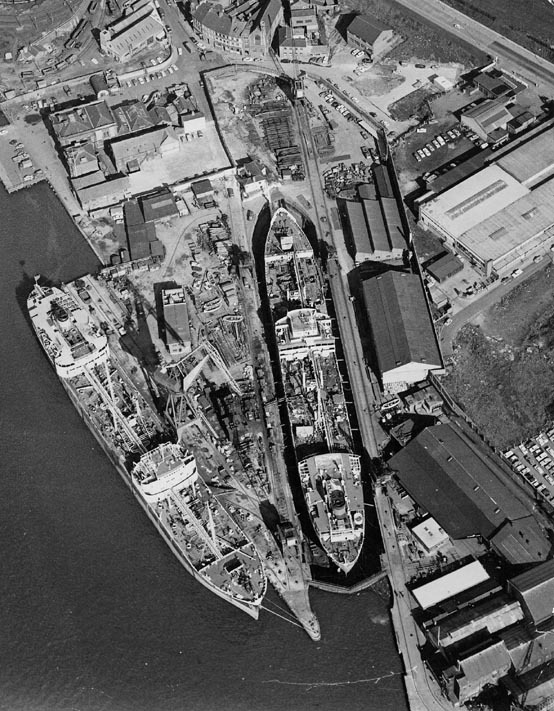 Ships were built on the Tyne, and sailed from her docks to ports all over the world. Ships also came from the five continents across the roughest seas and oceans of the world to bring cargo to Tyneside. 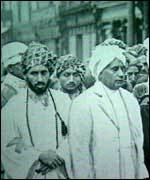 Among those cargoes, and working as boilermen, stokers or labouring men, were men from the Yemen, called Lascars. Ships frequently sailed from the port of Aden, and men from those shores came to Tyneside and settled - many are still there today. The first Arab Seamen's boarding house opened along the riverside in 1909. 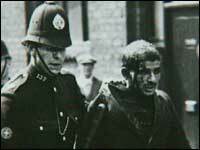 By the end of the first World War, the Yemenis living in South Shields numbered 3,000. Unfortunately, by 1919, campaigns were underway to drive these people out. Jobs were scarce after the war, and violence erupted, culminating in riots. Eight Arabs were sent to prison for their part in them. Since then, shipping interests: shipbuilding, and the dockyards that coped with incoming cargo, have declined. People of Yemeni origin still live in the town, and happily in a more cordial atmosphere. Oddly enough, the hill fort dating back to Roman times, is called Arbei, meaning 'the place of the Arabs' in the Arameic language, the native language of the last people stationed at the fort. by everyone from Salford and Manchester, as well as every town and village in the north west of England, lived most of his life in Salford. In the latter part of his life though, he lived in a stone house near the centre of the little village of Mottram in Longdendale, north east of Manchester, and on the road to Derbyshire and the Peak District. Travelling on the number 6 bus from Stalybridge to the Derbyshire milltown of Glossop at the foot of the High Peak, I always looked out for two things en route. 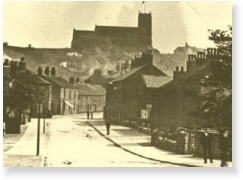 One was the petrified frog in the walls of Mottram Cutting, called 'Deep Cutting' by locals, and the other was Lowry's house on the right going towards the crossroads at the centre of the busy village. Later, taking my wife around the gallery in Salford Quays that bears his name and holds his paitings and sketches, I look at pictures of an age that is gone in these parts. 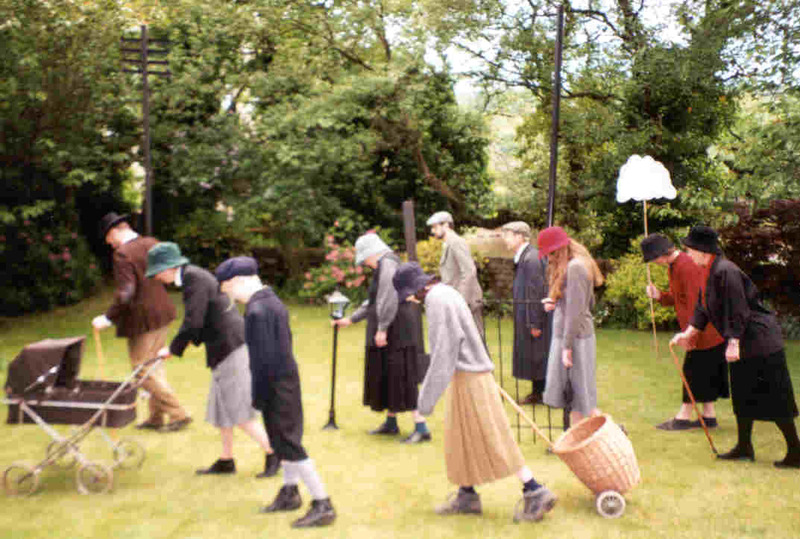 At five o'clock, when the mills turned out their workers, it was said that the main street of nearby Lees was flooded with lads and lasses rushing to get home for their tea. Today, no mill buzzers sound at five, or any other time, for that matter, though High Street in Lees does fill up - with traffic. People still have to work, but the number of places they are employed in has probably trebled. 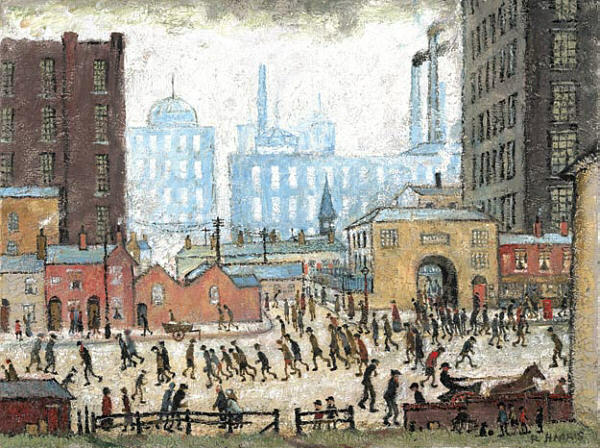 Lowry came from different days, and his work, though still popular with many, is probably not as popular with those of us who missed living though those days. To younger audiences, his paintings must look like lunar landscapes. Actually, that is what they most probably looked like to those peopling them; it's strange what you can get used to, isn't it? 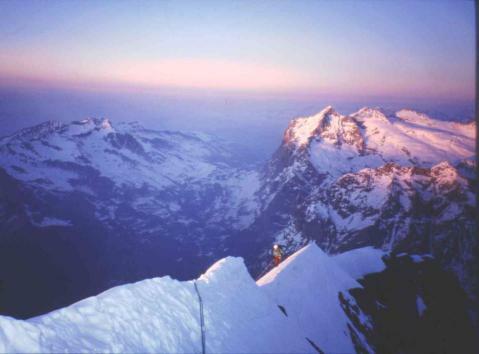 The north face of the Eiger was conquered in 1938, by a team of Austrian climbers, the most famous of which was Heinrich Harrer, who later gained fame by escaping the clutches of the British in India and journeying to Tibet. 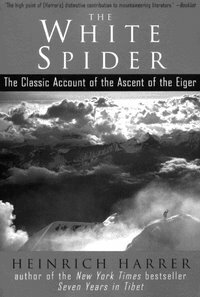 Harrer's book about this first ascent is the book, 'The White Spider', which is a set of snowed up cracks high on the mountain. It's a good name - the spider draws climbers into its web. To enter the aptly named Exit Cracks to the top is to escape from the spider's web. Looking up at the mountain from the pleasant meadows of Kleine Scheidegge, it is easy to understand the difficulties of the climb, though much harder to feel them. Many people have perished before and since. 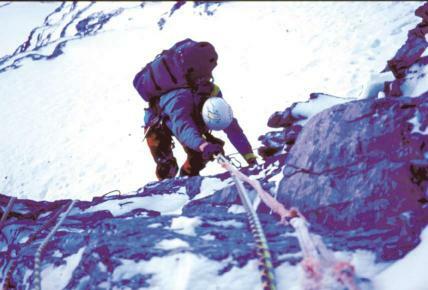 Some climbers are still frozen into the ice of the macabre 'Death Bivouac', a gruesome discovery for future teams attempting what is still, despite modern equipment and methods, a climb of tremendous objective dangers; snow and rock falls, sudden and unpredictable storms that sweep the face and freeze everything on it. The little train sets off from the Kleine Scheidegge, and buries its way into the mountain, stopping at the Eigerwand station on its way to the Jungfraujoch, the col between the Jungfrau and Monch mountains, neighbours to the more fearsome Eiger. 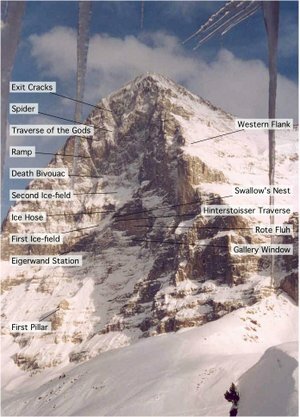 Even at the Eigerwand station, I remember, the air was sufficiently rarified to prevent us schoolchildren from running along the cold corridor to look out over the frozen north face. But even from this relatively low point in the face, the scale was frightening; sheer faces fell away from the window, and I wondered how anyone could survive out there. 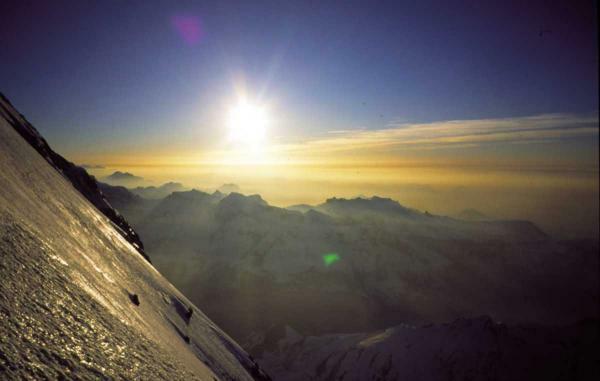 I never forgot that place or that feeling, and anybody brave enough to attempt the climb is, to my mind, truly courageous. 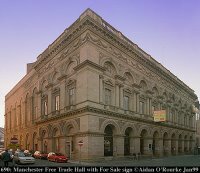 Before the Bridgewater Hall was built, the Halle, Manchester’s own orchestra performed at the Free Trade Hall on Peter Street, round the corner from the Library, down the street from the Midland Hotel. It was to the Free Trade Hall that I went every Thursday – on the train from Stalybridge, a few stops down the line to Huddersfield and Leeds. I washed and changed, had my tea, and ran down to the Station, eager to get there and see and hear everything. Buying a programme came first, and then I sat and read about the music I had paid to hear. This particular night they were putting on Berlioz’ ‘Symphonie Fantastique’. Fantastic Symphony, I called it. 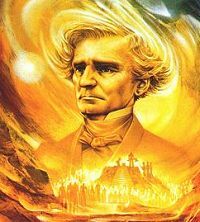 Hector Berlioz took his romantic desires much more seriously than I did, though I suppose I would have done if I had been wooing Harriet rather than Katie Hunt from Form 4A. He dreamed; fantasized; whatever lovers did in those more romantically inclined days, that he had killed his love; that he was to go to the scaffold, and that all this would take place on a Witches Sabbath. At least that is how I remember it. As the music flowed, I read the programme notes and followed the story, hearing the ‘idee fixe’, the main theme of the symphony, over and over until it became horribly parodied by the scenes at the scaffold, mocked by the witches. Berlioz’ score calls for some few notes to be played off the platform, audible to the audience, but sounding more remote. Accordingly, so the story goes, the player of the few notes, places himself just outside a door, which he keeps ajar the better to see the conductor cue him in. On this particular night, though you would never have known it sitting in the stalls, a janitor happened by just as the trumpet player was raising his instruments to his lips to play. “’ere,” said the janitor, horrified at what he saw, “you can’t play that thing here, there’s a show on just through there!” And so it went on, with the trumpeter struggling with the janitor, who he presumably placated or pushed away long enough to get the notes in at the right moment. I didn’t notice anything, but then it was my first time. I have since listened to that piece many times, and I always listen out for those few notes played offstage. I have never heard anything untoward, but I will be ready when there is. Cairo Mill in Waterhead, on the outskirts of Oldham, once a cotton mill, but more recently the home of an electronics giant, must have been in the sights of several interested groups while I worked there as an engineer in the 70s. One of the night-watchmen is reported to have seen a 30 foot circular object hovering above his hut in the middle of the night. Inevitably, there was talk that perhaps he had had one too many before coming on his shift. Nevertheless, reports of this sighting does appear in the literature on such things, so maybe old Fred did see something that night after all. In the year or so that I worked there, the whole factory had to be evacuated several times. Apparently, threats were made, and taken seriously enough to warrant us downing tools and slouching onto the car park to be counted, like so many children at a school fire-drill. In the event, nothing happened, we were allowed back in, and all was forgotten, until the next time. I have never heard of anything happening there since. There have been no return visits from extra-terrestials, or at any rate we haven't noticed any, and events in Northern Ireland are now happily much more stable than they were in those days. 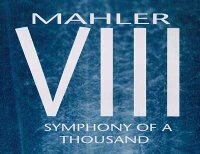 This was the intriguing title to a documentary I had seen chronicling the arduous task of transporting an orchestra big enough to perform Mahler's 8th Symphony, to an auditorium big enough to hold all the performers in this biggest of his massive ouput. 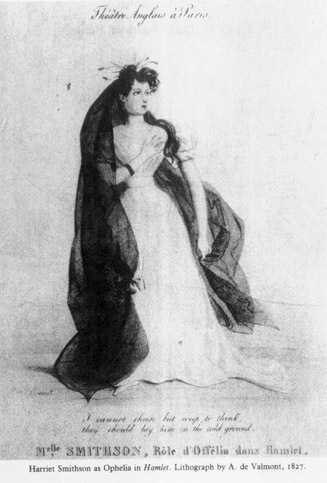 It was the impresario Gutmann who first gave the 8th the name, 'Symphony of a Thousand'; it was later given wider currency by Paul Stefan, author of the first book on Mahler. How could he have known the efforts impresarios would go through to have his music performed. On a warm summer's evening in August, I was walking up Lothian Road in the heart of Edinburgh. My destination was the huge Usher Hall, a superb Victorian building, which on this particular night was the venue for a performance of the 8th. As I was walking up towards the Hall I started to think about the composer, Mahler, who had been a hugely successful conductor in Vienna many years earlier, before his untimely death. He must, I thought, have walked to many such magnificent halls in Vienna on just such lovely evenings as this one. 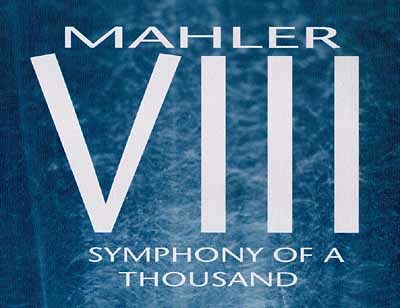 Thinking about Mahler, and the music I was about to hear, I began to whistle the opening bars of the symphony as my pace quickened. I whistled away, oblivious to the noise of the traffic, and perhaps my whistling grew louder in response to the hooting of car horns and the revving of engines. Suddenly, I heard a voice, a woman's voice at my side. "He's whistling our tune," she said to someone behind me. I looked round to discover that I was surrounded by women in long gowns. "Yes" said another to my left, "we're singing here tonight," she said, pointing at the grand building in front of us; the Usher Hall. These were some of the thousand performers about to take part in the musical evening. They had surrounded me, and they told me that they had all come down from the Granite City, Aberdeen. I asked them if they had rehearsed it up there, the thousand performers. "Oh no," another woman said, "we rehearsed our bit of it, and other groups in other cities, Perth, Dundee and Glasgow, they did the same, and last night we all rehearsed it together for the first time." The performance I was about to hear was only the second time that they had all sung and played together under one roof. They laughed gaily, and told me how nice it had been to meet the other performers for the first time last night, and they laughed again when I asked them how on Earth they had managed to rehearse only their own part of something so vast, so grand and so long. They couldn't really answer, but one of the women said, "You'll see." They said they had all thoroughly enjoyed taking part in something which had to be built up bit by bit, and put together in one live performance. They asked me where I came from, and I told them that I had traveled two hundred miles to hear the piece. They had traveled down from all over Scotland. 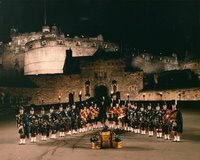 We had come from all over Britain to be there, to take part in one glorious evening of live musical entertainment. Music really does bring people together, doesn't it? Shortly afterwards, looking at the packed auditorium, the huge orchestra, choirs of robust looking men and handsome women, at the children's choir high up above the percussion section, and the soloists sitting impassively waiting for their key, it was easy to see where this name came from. 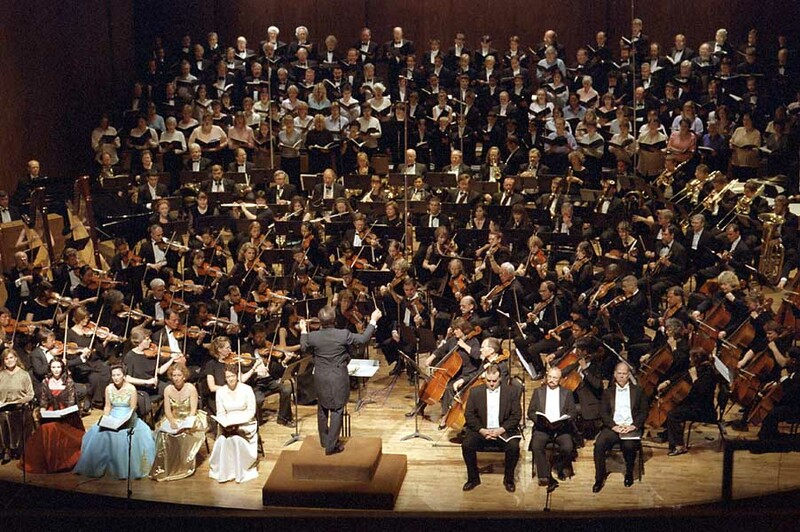 These days, it rarely requires a thousand performers. That wasn't the point. The name was coined, most probably, because of the impression of there being that many musicians - row upon row of florid faces, eight soloists, male and female choirs, a children's choir, a full orchestra and an organist, no less - no wonder it appeared that there were a thousand people on the platform that first night in Munich in September, 1910. And then it started, the organ bellowing the 'Veni, Creator, Spiritus' hymn to the very rafters of this great hall. And right up to the final triumphant, long held chord, this total music experience held us all in its grip. The applause was tumultuous. Tramping the highways and byways of Hardy's Wessex, that portion within the beautiful country of Dorset, I found myself following in the footsteps of Tess, Eustacia Vye, and Fanny Robin. 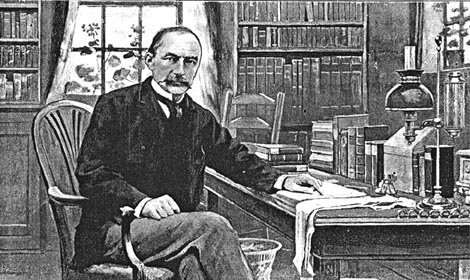 In the pages of Hardy's novels, this part of England: its people and their ways, their loves and losses, and their tragedies comes alive. But Max Gate, the house Hardy built and lived in before his death is different. It forms no part of the landscape he peopled with the rustics and squires of the day. 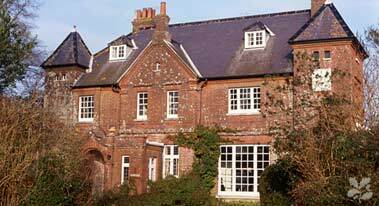 This was Hardy's last home in an age of arguably greater reflection and pastoral stability. It was into this world that he led us through thwarted ambition, unrequited love, and opportunities missed; a world that many would probably wish we could return to despite the personal tragedies and disappointments that fell from the pages of his great works, for in terms of personal relationships, nothing has really changed, which is why Hardy's tales still make valid comment on the most human of all our traits, the desire to love and be loved. We tramped those hills together, Roy and Steve and myself, in a hot summer – one of many in my memory. Carrying everything on our backs like two legged pack-animals, we climbed over stiles in white limestone walls, walked gingerly across cattle grids, scraped cow muck off our boots before we trudged into a café for a brew, and grew weary of the path long before dark. 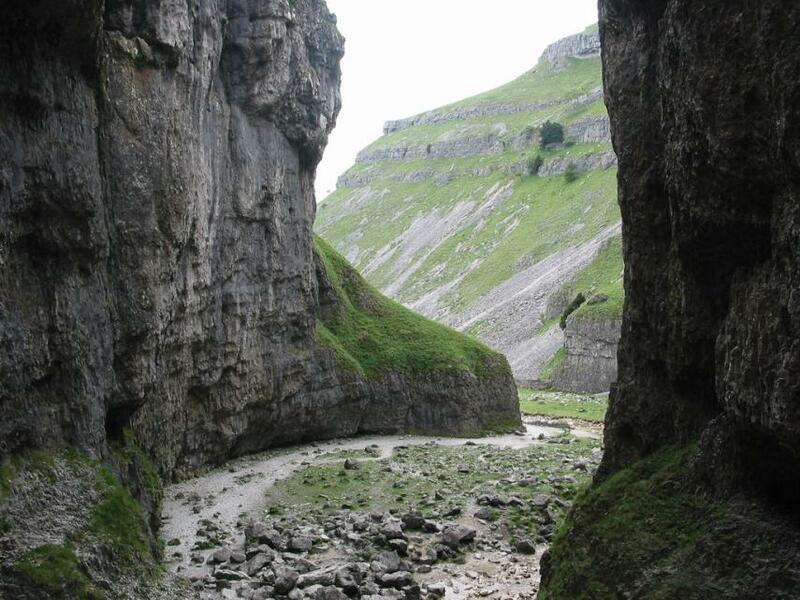 Alone on the camp site below grim Gordale Scar, frowning majestically above us, we pitched only one of our two tents. The woman in the farmhouse looked us up and down, made some decision about the means of our parents and charged us by the tent. -Two tents, that’ll be two quid. 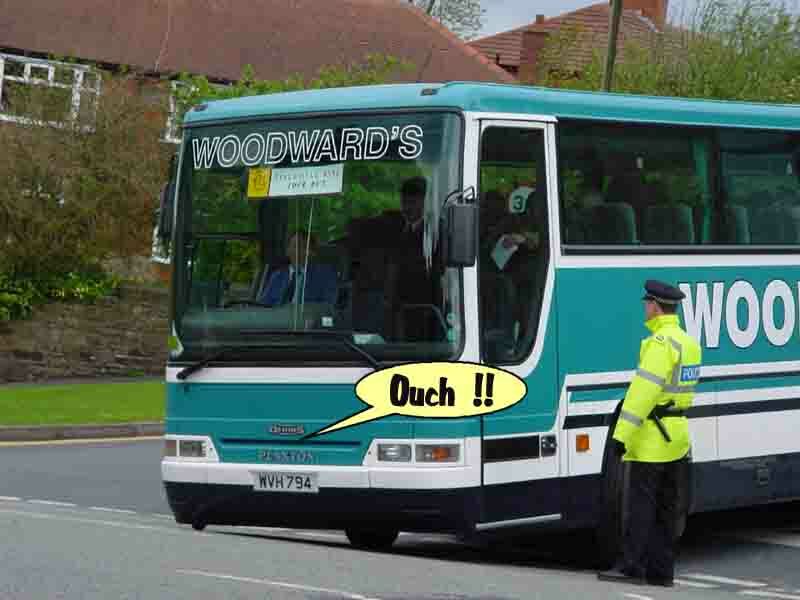 -A quid for one then, said Steve, his sore feet making him unusually impatient. We put up the tent, and were glad we had when night fell. 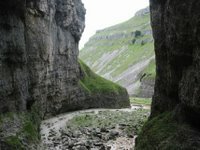 The loneliness of the limestone walls and the overbearing cliffs stifled our normal cheerfulness. Without much in the way of illumination, bedtime comes early as it must have done down through the ages before the electric light, the match and the candle drew out the evenings. -Got these, said Roy turning out a packet of broken digestives from his pack. We grinned – something to cheer us. -I’ll brew up. And we sat and crunched our way through the packet, argued about the last one, supped our coffee that had remnants of dunked biscuits in the dregs. Next came the day’s swansong, which tonight started with ghost stories – a man called for his girl – half way to somewhere she disappeared off the back of his Matchless – he went back to find her, was told she’d died some hours earlier – that sort of thing – things we could relate to and that had happened to lads like us. Coffee and ghost stories don’t sit well together where sleep is concerned. I stared up and out for hours before the dawn came up and we each discovered the other two had also been wide awake. And then when the sun did creep over the cliff to plunge us into full daylight, we all went to sleep and dreamed quietly through the early morning until a cow pushed its wet, pink and black nose into our tent and woke us up at ten. 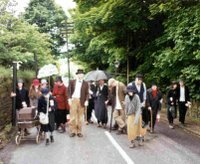 On Whit Friday, after the church processions and the children's activities in the playing fields in Uppermill's 'backmeadow', the brass bands begin to arrive - by coach - up to about 50 of them, adding to the general congestion of the streets, roads, squares, and crossroads of Saddleworth. Brass band concerts - about 14 of them, though I couldn't name them all for you, and a few are just outside the boundaries, start up ar 4.30pm and go on until the conductors can't see enough of their music to conduct. Famous names - Brighouse and Raistrick, Black Dyke Mills, Grimethorpe and local ones, Mossley Silver Prize Band, Boarshurst Band, Dobcross Band, and lots and lots of school bands, Mossley Hollins School, Count Hill Grammar School - all competing for prizemoney, and the prestige gained from winning at a Saddleworth brass band concert. Grand tunes, some heard over and over again - the popular ones - Sentator, Mephistopheles, Knight Templar - good old marching favourites for this night of nights for band chaps and huge audiences of people, young and not so young, enjoying the greatest free night's entertainment the north has to offer. Try to get to it this year - you will enjoy it, and you'll meet old friends who you haven't seen since last Whit Friday. 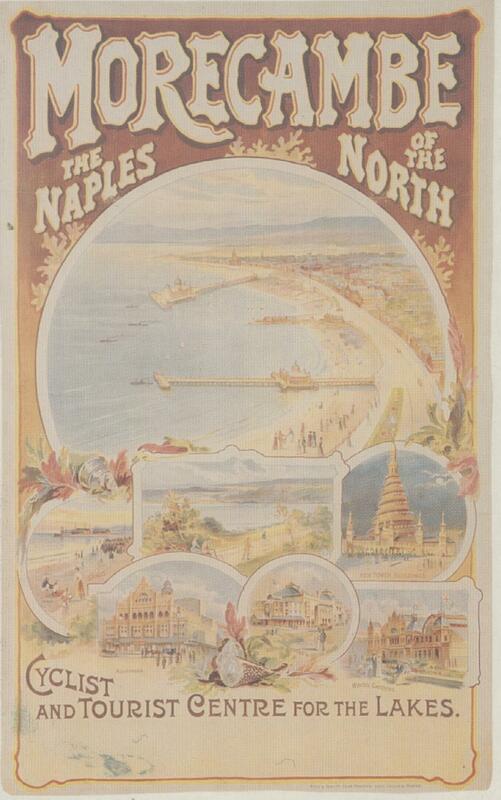 They say, 'See Naples and die', don't they, but if you can drag yourself away from the slot machines and the bingo and all that, try walking along the prom, up towards Bare, going in the direction of Carnforth, and I'll show something to make you change your mind, as the song goes. Morecambe Bay is expansive, sweeps round in almost a full arc, from Heysham with its twin megaliths: Heysham A and B, past the Lakes away in the distance, with Grange over Sands in the foreground, the machine shops of Vickers in Barrow hardly visible, Walney Island, just off Barrow, and then right round to Carnforth, Wharton and Bare. As an undergraduate at Lancaster, I spent my second year at Lord Street, upstairs from the Melletts who are still there, though no longer renting rooms to noisy students, coming in from the Sugar House in Lancaster at all hours. 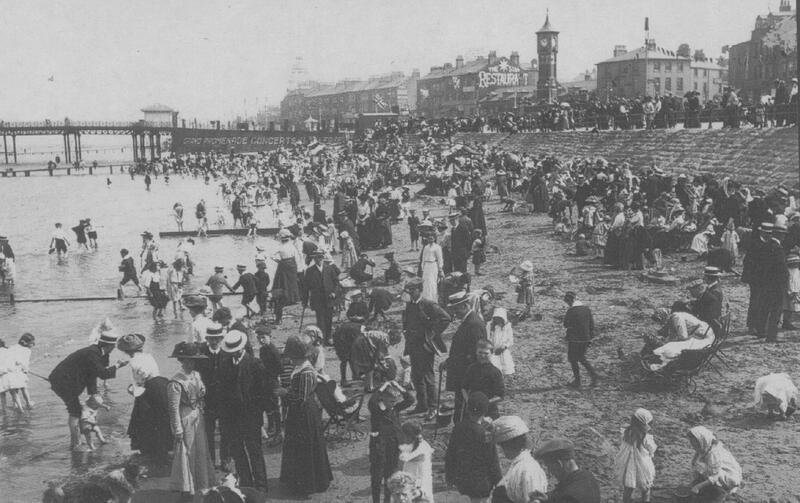 It's hard to imagine it these days, but Morecambe was once hugely popular with holidaymakers, second only to Blackpool - just the place to enjoy a long weekend in an Indian summer in September, which we always did when we were young. Go into the railway station, just down the road from the stately Midland Hotel - look in the Gents if you're a gent - the number of urinals indicates the resort's popularity - trainloads of happy millworkers from Oldham, Nelson, Brierfield, and Ashton Under Lyne stepping off trains, kids with buckets and spades ready to excavate sections of the beach, Dads with 'Kiss-me-quick hats or the proverbial knotted handkerchief at the ready for the sun, and Mums bringing up the rear, loaded down, a parasol in case it gets too hot, bags crammed with all sorts of stuff, making for the taxi rank to get up to the lodge, as my Gran used to call the guest house where we stayed.